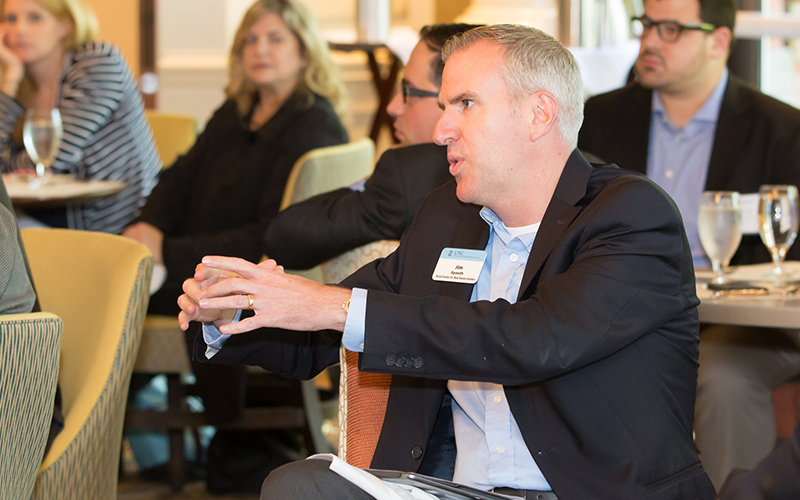 The words of Mick Jagger were probably on the minds of many at the 2018 UNC Real Estate Research Symposium on October 11-12. As the remnants of Hurricane Michael came crashing through the Raleigh-Durham area, participants battled flight delays, cancellations and power outages to get to the Rizzo Center in Chapel Hill. But in spite of the complications, more than 80 participants braved the storm to discuss the most recent research in commercial real estate. Below are some high-level highlights of the conference. 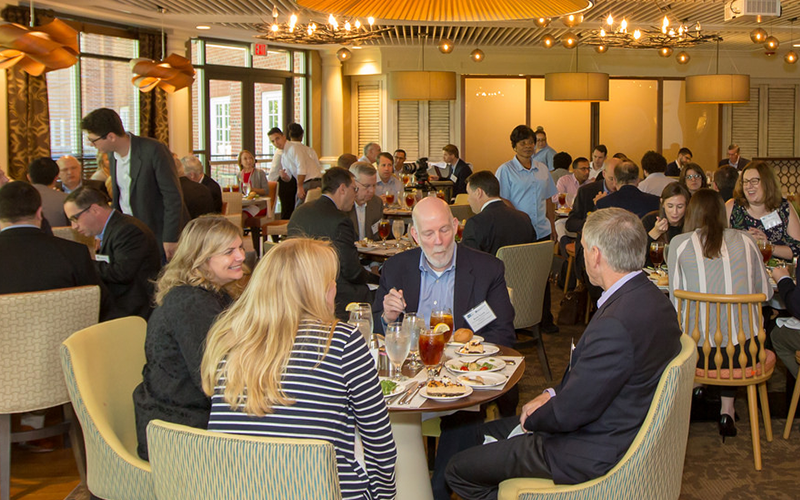 2018 Real Estate Research Symposium attendees convened at the Meadowmont Grill in McLean Hall at the Rizzo Center for lunch and a keynote address on Friday, Oct. 12. 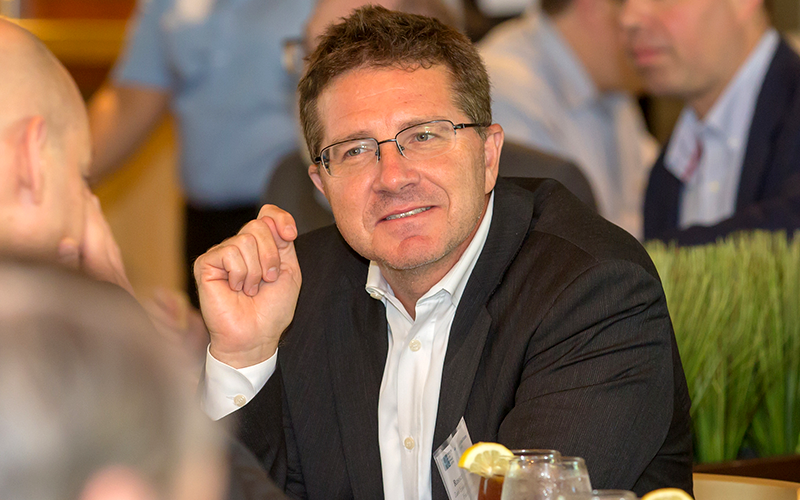 Rossen Valkanov, professor of Finance at the University of California, San Diego, talks with a colleague during lunch. 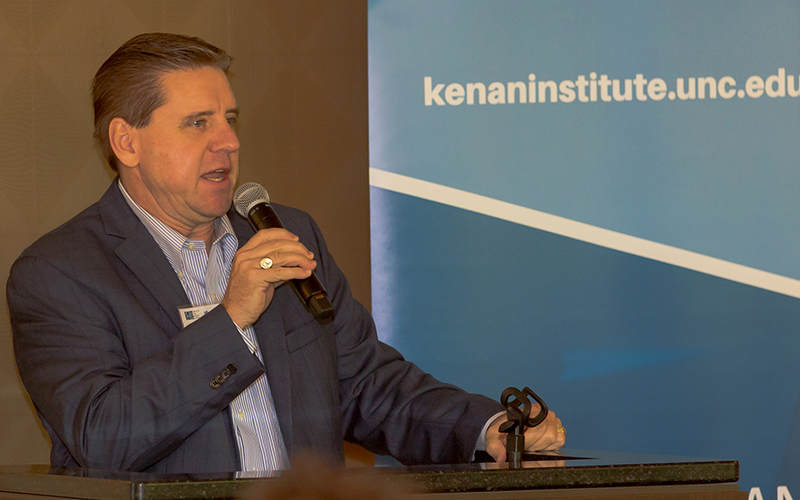 Greg Brown, director of the Institute for Private Capital and the Kenan Institute of Private Enterprise, introduces keynote speaker Sheridan Titman. 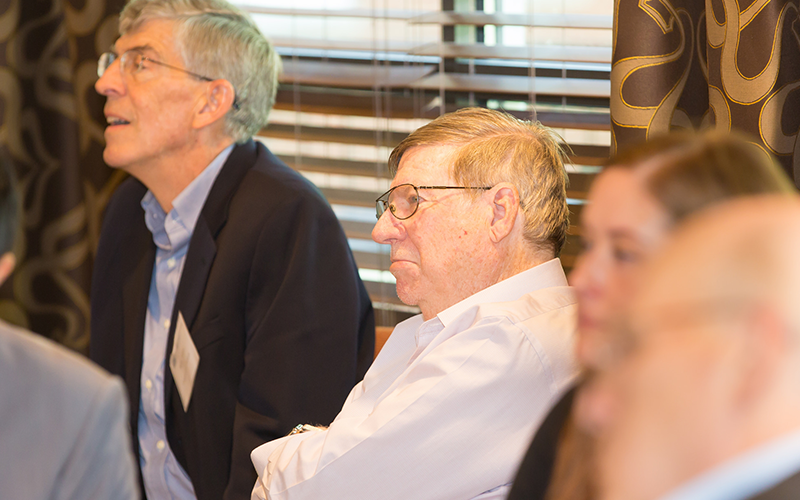 Symposium attendees listen to Titman’s research on central business districts. 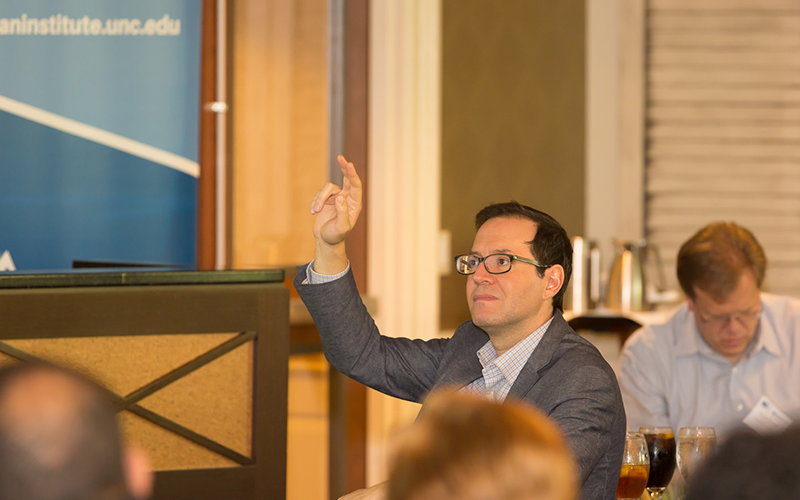 Jacob Sagi, UNC Kenan-Flagler Business School Professor of Finance and Wood Center in Real Estate Distinguished Scholar raises his hand to ask a question on Titman’s research. 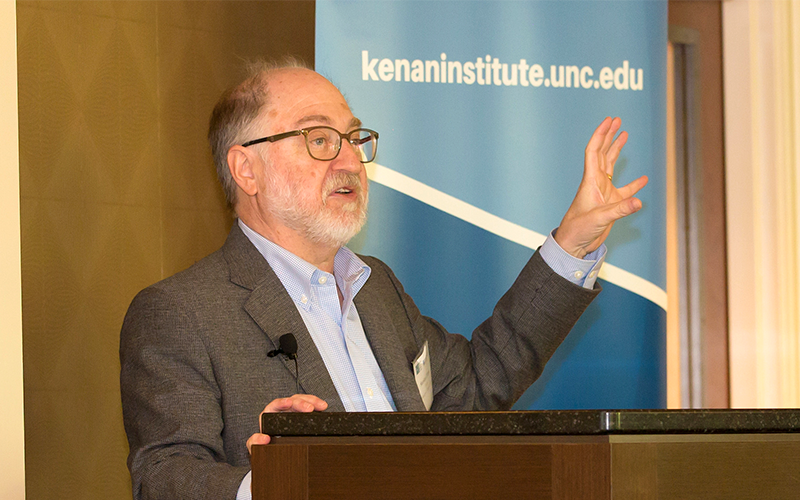 Jim Spaeth, executive director of the Leonard W. Wood Center for Real Estate Studies, an affiliate of the Kenan Institute of Private Enterprise, engages with Titman. Sheridan Titman, University of Texas-Austin, on the intersection of urban economics and finance, sharing empirical work on how agglomeration effects can lead to high rents in certain geographical areas. Titman showed how the working preferences of financial services professionals (namely, a need for face-to-face contact with peers in other firms) faciliated the development of concentrated financial districts in large cities such as New York, London and Hong Kong, and the subsequent raising of rents within those districts. Spenser Robinson, Central Michigan University, on the increasing importance of walkability as a real estate characteristic, and standardization of the data used to measure walkability to improve the accuracy of findings.